There are multiple focal points to both MALI and the larger Parque de la Exposicion. 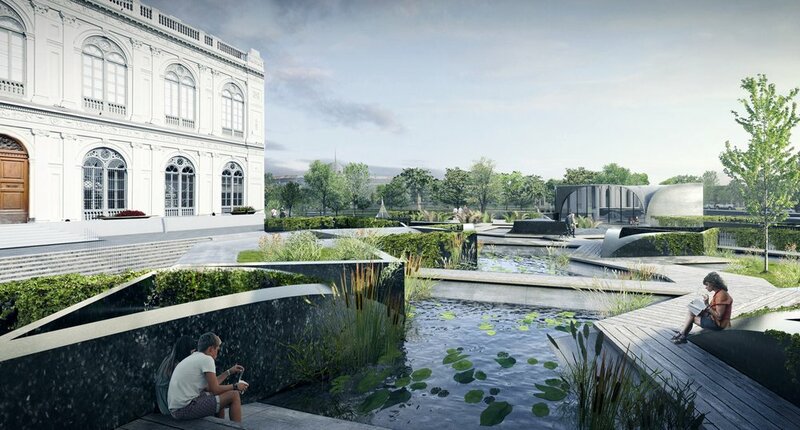 The intention of our design is to bring localized clarity and resonance to each focal point, reconciling the obvious significance of the Palacio de la Exposicion with the NewContemporary Art Wing - which urbanistically an culturally demands its own identity despite being nearly entirely below grade. The organizing principles of our proposal for the New Contemporary Art Wing are based upon the plan inversions of two mirrored ellipses creating a structural and conceptual grid. The geometric logic of the ellipse, its curve orbiting two focal points, allows the New Contemporary Art Wing to stand in contrast to the orthogonal, rectilinear logic of the existing historic Palacio de la Exposicion. This critical difference allows the New Wing to achieve a perceivable iconic identity despite being significantly less visible than the Palacio. The grid is primarily composed of reinforced concrete vaults cresting just above ground level at the plaza. Here, the exposed concrete shells and layered walkways can be experienced as an undulating and layered field condition. Below, at the education level (-1), the vaults are a nod to the Palacio’s repetition of arches and significantly create a spatially charged environment for the classrooms and central spine (the “Great Hall”), which may also host temporary exhibitions. Sixteen of the vault segments are confused and have been turned upside down; they are inverted light funnels or “snoots” working to bring natural light to the exhibition level (-2). The upper tips of the snoots in the plaza (0) are open to below as glass courtyards at the education level (-1). Every classroom is adjacent to a courtyard, allowing for natural light and ventilation.